"Arthur Bell & Sons plc"
A good 8 years. Perhaps too bitter end. A dram of 8 years very correct ... may be less today at this price however. There are fresh fruits and mainly honey. Behind a small note of solvent "not the bad, huh" strolls with a zest of citrus. The attack is light, normal at this alcoholic degree. In spite of the 8 years only, the barrel put his paw on this whisky which is mainly wooded and spicy. We realize after a few moments that alcohol is not so well integrated as it unfortunately. Fruity honey notes wander here and there. Average length on the woody bitterness with this nice little saline note. 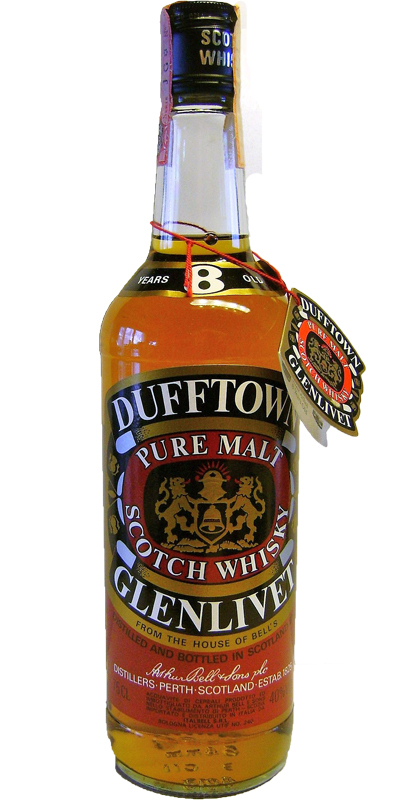 Ooh, and old bottling of Dufftown, when then-owner Arthur Bell & Sons still put Dufftown-Glenlivet on their label and were allowed to call their 8 years old a Pure Malt. This is a bottling from the 1980s. Well, this surely is not a representative tasting note for this bottle, as it is clearly flawed with OBE as a result. Hence no score. Ouch! The bottle was clearly not sealed well enough. The whisky shows apple and gooseberries, but this is overpowered by an unruly sourness as if from nettles and dandelions mixed with lemon juice. Very green, if you know what I mean. The arrival is watery and flat. Again very sour. Lemon and apple juice, honey. Citric acid, there is no other term for it. And loads of OBE, not totally unexpected, but in this case it truly kills the whisky. The finish is mercilessly long and makes me pull faces. Yikes! Again for an 8 year entry level malt this is good stuff and easy to drink. If you got an 8 year offering today it would be of lower standard than this. warm shortbread, honey mixed with apple. There is also something that reminds me of Lucozade mixed with Iron Bru, which I quite like. A little thin on the palate and quite hot for 40%, it is also quite fizzy. There is a little lemon mixed with honey . Overall it is quite light. Pretty long considering it is only an 8 year. N: Lots of density here from this pleasing old style blend. Sweet, over ripe apples, sherried raisins, prunes, figs, ginger cake, touches of Osmo Polyx Oil, husky & hammy notes and some caramelled vanillas - but this isn’t about clarity and details, its about the resulting consolidation from blending and its a pleasing moorish start. Plenty of sherry casks in the midst thats for sure. C: A pleasing drink to be drunk, one which [occasionally] hits that easy sweet spot - like a Balti curry. An "old style" Speyside whisky, nota bene from Dufftown. Fresh corn with butter and lots of herbs (dusty, waxy and farmy), soft and comfortable, a delicious drop. Definitely recommended to open once a slightly older bottle, especially from the early 80s, bottles are still available at a reasonable prices.